I’m back from the Libre Software Meeting (RMLL), took me some time to recover from the highly packed week. Indeed, in addition to the mandatory Haiku booth, I had 4 talks to give (and so slides to finish), and I ended up being chairman for the Embedded track. Luckily Olivier was here as well to look after the booth, even though he was also involved with the organization. On Sunday, after some hours by train (and the last part got cancelled so I had to wait for the next train), Olivier picked me at the station and I arrived as Richard Stallman was finishing his speech. I said hello to the known faces, some of which you get to see once a year, and made sure I had a room this time (so we didn’t have to end up at the hotel as we did last year), and then helped at tidying up the place. Each year the civic agents are amazed how efficient we are as a group when we help them. Then I went to the boarding school where I lodged. The only detail was we could only get in every two hours, which requires some planning but wasn’t much of a trouble in the end. I took the time to finish the slides for my first talk. On Monday we moved to the university, and after setting up the booth with Olivier I went to check the opening plenary session, where a dozen speakers explained the differences between their non-profits, and their hopes for the future. Then for my first talk of the week, I explained the requirements for implementing proper accessibility in Haiku and existing APIs we could use, most notably the scripting interface which would be very helpful to a screen reader. Since it was not only about Haiku but also about accessibility which is one of the global threads of the event, I had an unusual audience. Someone said it was interesting to hear about accessibility with the technical details, unlike the usual talks on this subject which focus more on the theories and design behind it. 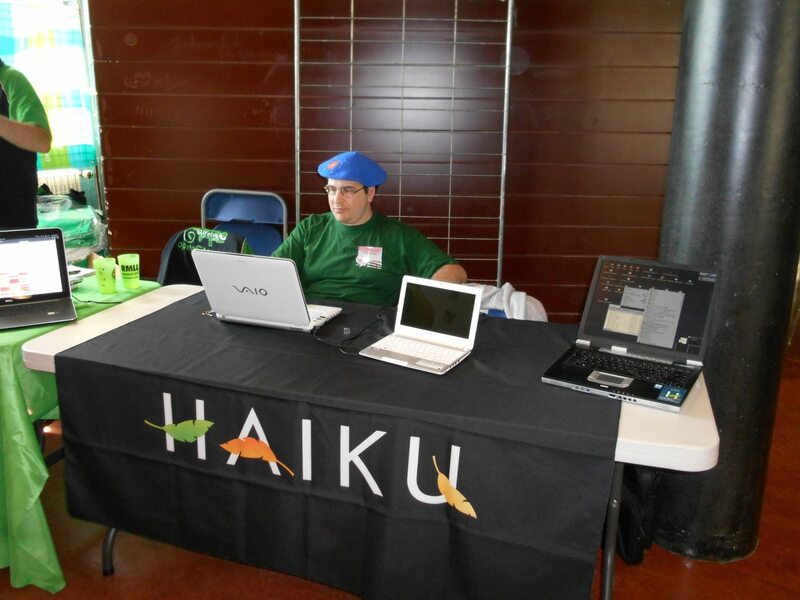 On Tuesday I gave a second talk, this time about Weboob, a web scraping framework to interact with websites from the shell, which I started porting to Haiku. Then I looked after some other talks in the Infrastructure track in the afternoon, doing timekeeping and checking how many people attend. Wednesday was quite busy as I had my last two talks, starting with the ARM and PPC Haiku ports at 9 am, with a few courageous people attending. The other talks of the Embedded track got some more people. I also gave a talk about SleepyHead, which reads data from CPAP machines, one of the possible treatments for sleep apnea. On Thursday I was relieved and had more time to spend at the booth. It wasn’t very crowded but we had interesting conversations nevertheless, and the usual “is it a Linux distro?” questions as well. In the evening the “Repas du libre”, the official dinner, provided more conversations with some people who sometimes were too busy attending talks the whole week to pass by the booths. Friday was really quiet, with almost no talks, so more time to spend at the booth, and a closing plenary to discuss the future editions. Then we had to tidy up, which was done in no time. I stayed until Saturday, and helped there with the last things, before leaving for the train. Going to the RMLL is always a pleasure, and this time was as well. It is also quite exhausting, and so was this edition (why did I submit 4 talk proposals ? :-D), but it’s worth it. This year’s was really nice and I look forward to the next one already! A big thanks to the organization team which was really efficient and helpful. The videos should be online now, but in french. You can also check the photos for the event.